Once coming to Mui Ne, one of the coastal cities in Vietnam, you should not forget to try kitesurfing service. Kitesurfing will be an intelligent choice, as the oceanic water together with the flow of the wind will provide the dynamic force for the kite to reach the highest point in the sky. Especially, there are a range of kitesurfing classes that you can join to approach this kind of activity. Meanwhile, when taking a rest by lying on the beach, you can witness many colourful kites with different size and height hung on the blue sky, under the constant sunshine, creating a perfect scenery for the summer. For booking a course, you would spend about $60 per person. There are also some extra fees for hiring kites and other commodities. But don’t forget to make a room reservation, because it is the real peak season in Phan Thiet at that time. If you are still hesitant to finding and choosing luxurious accommodation, let’s contact us to get the reasonable answer. Nha Trang beach is also considered as an indispensable part of your Vietnam and Cambodia summer vacation. Nha Trang owns itself one of the most diverse and colourful marine environment. This makes sea-walking become so famous recently. You can enjoy diving with your companions to discover different creatures like starfish, tropical fish, and also corals and marine plants. No matter how good your swimming ability is, this kind of sport will make you get over the scare of water and give you an extremely interesting experience. What could be more wonderful than deepening in the cool water and explore the ocean in the hot summer holiday? For booking procedure, you can visit the official website – Nha Trang Sea Walker. 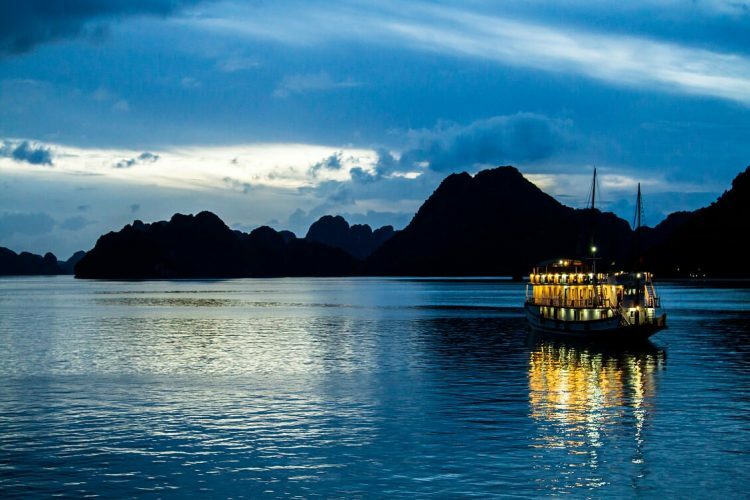 Ha Long Bay is originally reviewed as one of the unforgettable destinations of many tourists when coming to Vietnam. 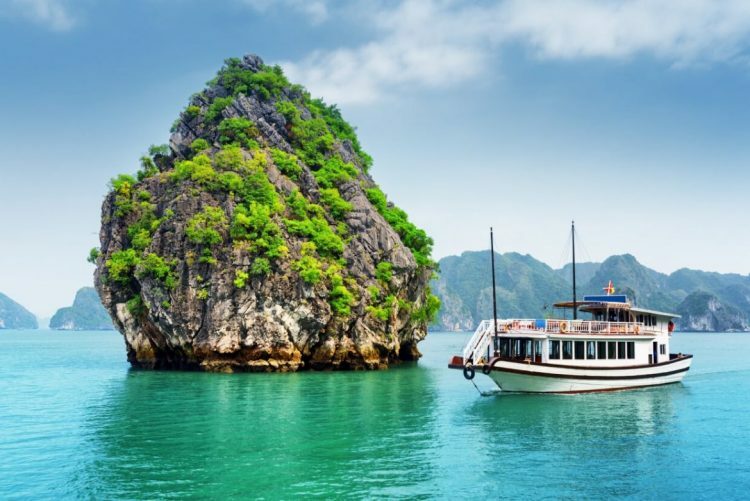 Its beauty resides in the combination of natural limestone mountains emerging among the marvellous ocean with beautiful islands and floating villages. As taking a tour on a luxurious cruise for 3 or 4 days, you will completely discover all the mystery of this wonder. Let’s try enjoying the beauty of nature, admiring the sunset in front of an infinitive space, and indulge yourselves in the best service of a five-star cruise. It appears as the initial suggestion for you to take into consideration. To get the best experience that will suit your abilities and the weather conditions on the way, always take the advice of our travel expert. 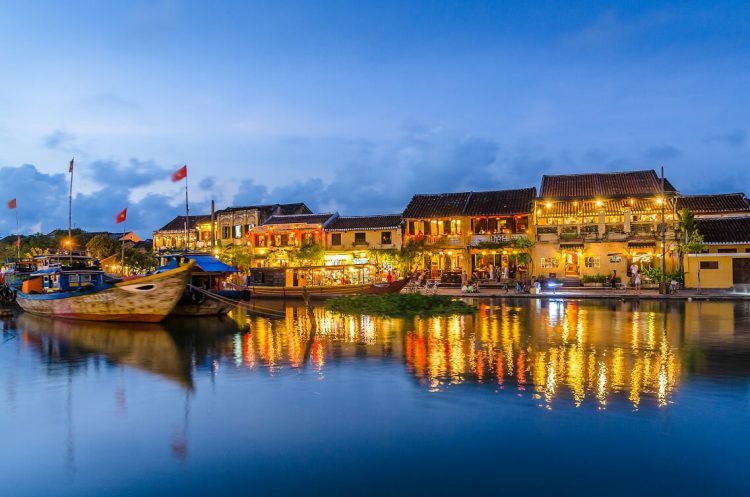 The next thing that should be picked into your itinerary during Vietnam and Cambodia summer vacation is strolling along Hoi An Riverside to discover its poetic beauty. Hoi An used to be the hotspot of merchants from different countries. They came here to exchange and purchase the commodity. Nowadays, the bustling market has no longer remained. In contrast, Hoi An now attracts the curiosity of tourists coming from various countries. The traditional and cultural features come together, creating a remarkable Hoi An in the eyes of travellers. Hoi An Riverside is mainly the significance of this Vietnam tourist spot. If you decide to go during the daytime, it is easy to capture the ancient beauty of the residential houses which were built more than 300 years ago. Or else, you can also walk along the streets in the evening to witness many colourful handmade lanterns hung on the road. Nearby, many out-of-town visitors are hanging out on the pavement. 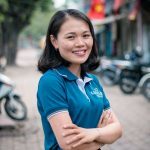 All in one, those elements make Hoi An more friendly and impressive. Don’t forget that this is the perfect time to get the best picture during your summer excursion. The nickname “Pearl Island” of Phu Quoc comes from its distinguished features of the water, ocean and environment here. Phu Quoc is a private island located in Kien Giang province, just about 26 kilometres to the border of Cambodia. Visitors coming to Phu Quoc always try to conquer the ocean by participating in many sports such as scuba diving and snorkelling. As Phu Quoc has no winter, these activities are popular and available almost in every period of time of the year. Deep into the sea, you can be able to admire the splendid beauty of coral reefs, the liveliness of different kinds of marine fish and plants. The water is fresh enough for you to see clearly everything through the glasses. To get rid of any difficulties in making a reservation, you can choose to stay in the hotel where they offer available scuba diving and snorkelling services like Vinpearl Phu Quoc, JW Marriot, Intercontinental Hotel, Novotel Resort and so on. For further information, please leave us a message, then we will be here to support you. Situated in the off-coast area of Sihanoukville (Cambodia), Koh Rong island has gradually conquered the heart of visitors coming for holidays. Koh Rong Island will truly mesmerise you because of its breathtaking and unique natural beauty. Blue ocean, pristine white-sand beach and glorious sunshine create a mixture of picturesque and peaceful scenery. Its special location provides private spaces for a true summer escape. Standing in front of a huge coastline, admiring the beautiful sunrise, sunset picture, enjoying the spa and therapy treatment at the luxurious spa, capturing every moment that you have spent, what do you expect more than that? However, it is not easy to find and reserve a good accommodation in Koh Rong, especially when you design a trip in the peak season. Therefore, in order to avoid any risky and unexpected inconvenience during your holiday, you should ask the local guide for any assistance. Otherwise, you can combine Koh Rong tour with other destination to offer an all-inclusive summer vacation from the travel agency. 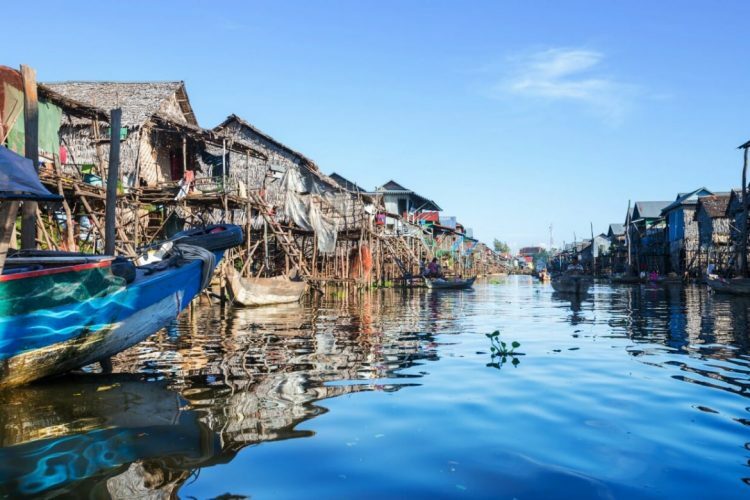 Your summer vacation in Cambodia will make a big mistake unless you intend to go to Tonle Sap Lake, one of the biggest lakes in Southeast Asia. And it could be a regrettable thing if you do not visit the floating villages located on a side of the lake. Kompong Phluk is the cluster of three different floating villages on Tonle Sap lake. This place is not only the home of more than 3000 residents, but also an interesting tourist attraction of domestic and international travellers. Everything happens on the water. The residents build their houses on the boat, create a mobile market to exchange and purchase goods. Therefore, the only way to get access to the village is by sailing boat. You can offer a day-time tour to follow the villagers and discover their routines, daily activities and even the unique culture of a floating village. You will also witness the lively life of the children here. However poor they are, their smiles have never disappeared on their faces. Even their welcoming, friendliness and kindness will make your discovering trip more meaningful and notable. If you have a tendency to come to Siem Reap, do not forget this special destination! Visiting National Park is now a trend of spending the summer holiday in Vietnam and Cambodia. Popokvil becomes more and more popular and well-known for providing good scenery for the travellers when they discover this wide park. The waterfall has become a real highlight for trekking tour in Bokor, as huge blocks of bright and dark stones accidentally appear in a special way. They create a picturesque paradise deep into the forest. Take a rest near the waterfall, listen to the whistling of water, hang out with your companions about the upcoming plans, pamper yourselves in the fresh cool water flow. Thé pristine life appears right in front of your eyes. In order to get here, you should make sure that the accommodation is available for you to get into Bokor National Park. Consider the option of making an all-inclusive tour from travel agency to prevent unexpected situations! Instead of lying on the beach, enjoying the sundowners, taking part in water sports, discovering the distinguished lifestyle of Vietnamese and Cambodian people, some prefer to go trekking to explore the pristine beauty of nature. 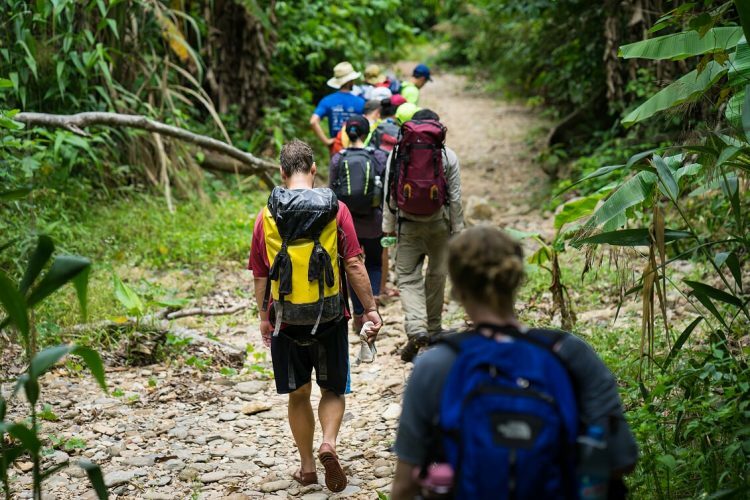 Kep National Park offers the trekking tour for travellers. You can choose to take either an eight-kilometre route trekking around the place, or a partial trekking way (with the help of the trail to go through the park). There, you will witness a breathtaking picture of Cambodia jungle with exotic plants and animals. Standing on the highest mountain of Kep National Park, you can easily take a view of the whole countryside region of Cambodia, and admire the sunset view from the Sunset Rock. Before the journey, try to bring as much mineral with you as possible, because the trip will make you exhausted. Also, wear decent shoes and bring provisory clothes in case you get wet. Situated approximately 120 from Siem Reap, Koh Ker stands as one of Cambodia’s special archaeological constructions of the Khmer people. 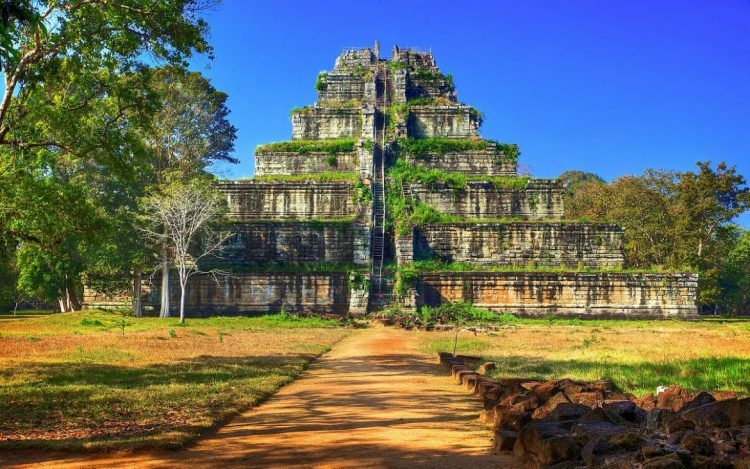 Sam Osmanagich, one of the explorers to Koh Ker commented: “After I saw many temples, I arrived at the conclusion that the Koh Ker pyramid is the only true pyramid on Cambodian land. It seems that it has nothing in common with the other pyramidal temples, largely decorated with Hindu symbols.” This temple gives not only him but also other visitors a unique sensation of the architecture. Here, the architect carefully designed the structure, water surfaces, and water channels in an appropriate way, so that the whole pyramid could balance itself even in the worst weather condition. Therefore, you must come here once in your lifetime to reveal all of the mystery in this outstanding construction. You’ve gone over the recommended things that you should try during your summer vacation in Vietnam and Cambodia. Those are just the suggestion for you to experience the best holiday when coming to our countries. If you prefer any ideas, put it into your itinerary and complete the plans as soon as possible. Share your ideal intention to our Luxury Travel and you are all set. 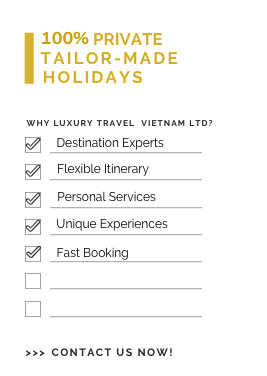 Luxury Travel is not only an assistant but also a friend of many international visitors to Vietnam and Cambodia. 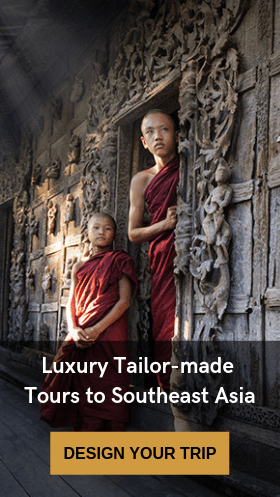 For the last 30 years, we have been continuously making effort to create authentic experiences for discerning travellers. We are confident that spending the holiday with us will be the most memorable one for you and your companions!